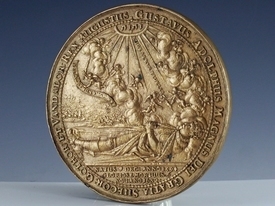 Historical medal of King Gustavus II Adolphus of Sweden. 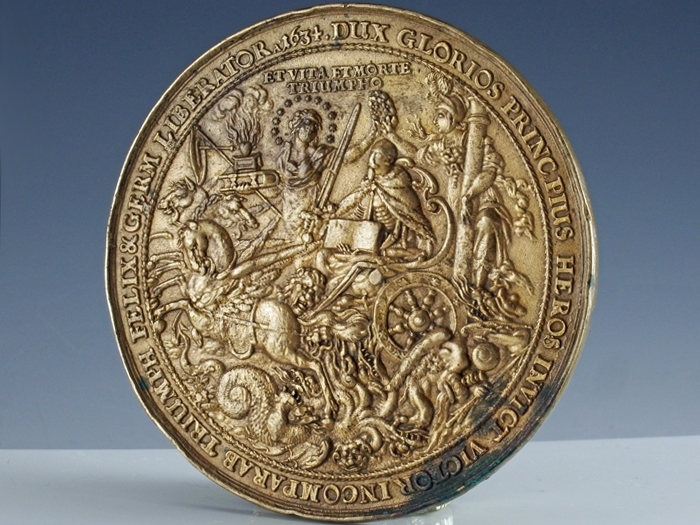 This medal was ordered from Dadler in Gdansk to commemorate the second anniversary of the King's death, following his victory at the Battle of Lutzen. 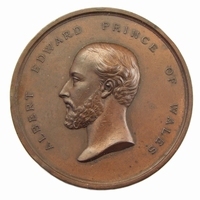 This bronze medal is a later cast from around 1800. Obv: Body of the King, lying in state on the battlefield, two angels carry his soul to heaven. 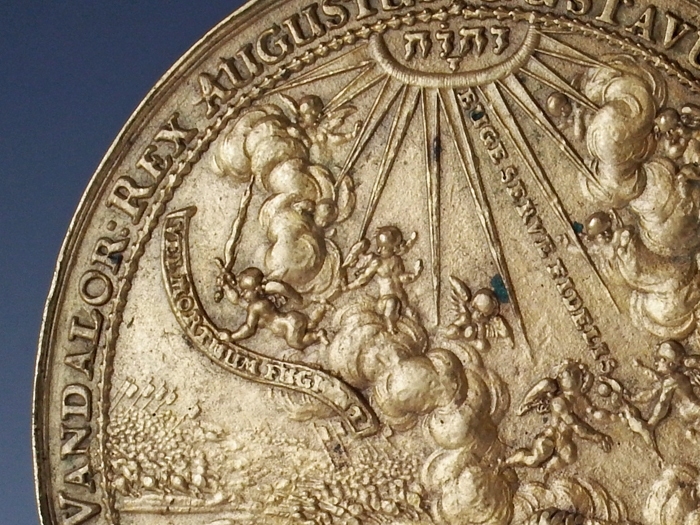 Hebrew 'Jehovah' in radiant halo above. 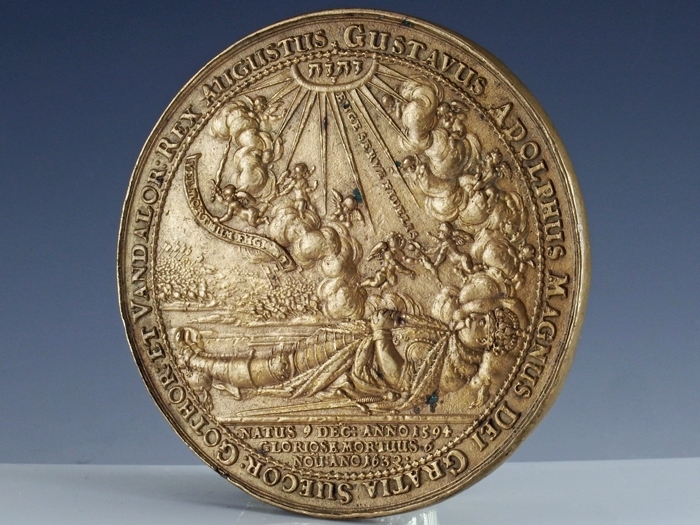 Clouds with angels, inscription: EUGE SERVE FIDELIS. 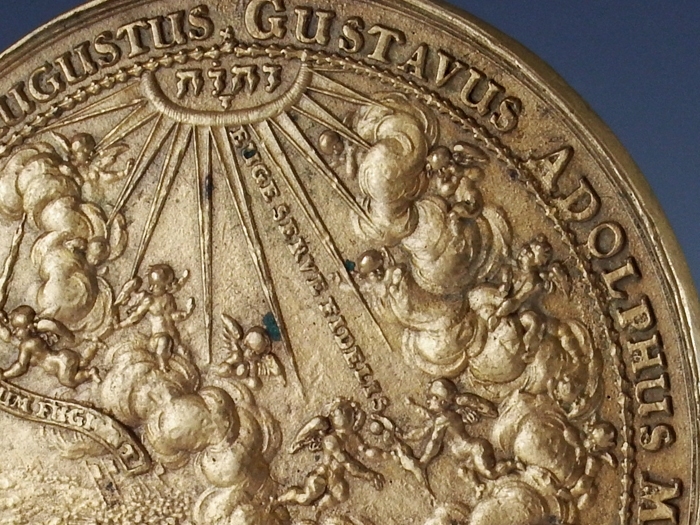 GUSTAVUS ADOLPHUS MAGNUS DEI GRATIA SUECOR:GOTHOR:ET VANDALOR:REX AUGUSTUS. (Gustavus Adolphus the Great, by the Grace of God, Revered King of the Swedes, Goths and Vandals). 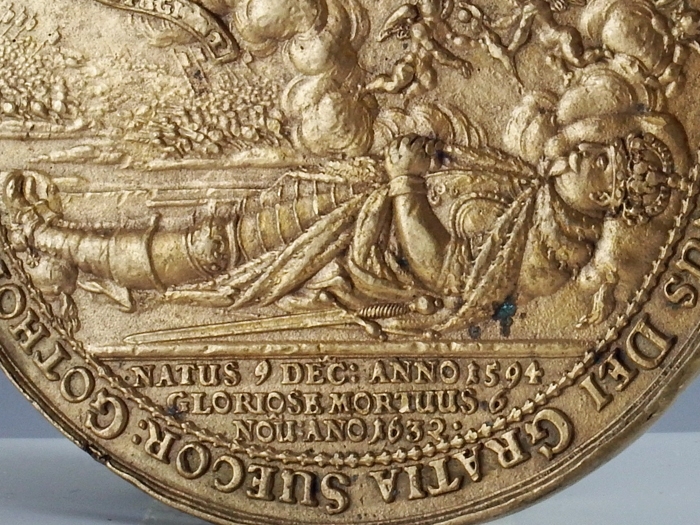 Exergue: NATUS 9 DEC:ANNO 1594 GLORIOSE MORTUUS 6 NOU:ANO 1632. 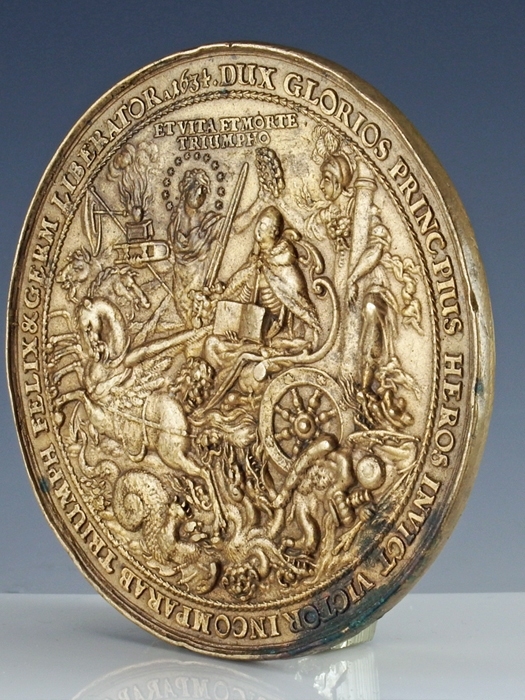 Rev: King Gustavus in triumphal chariot tramples Hydra of discord. 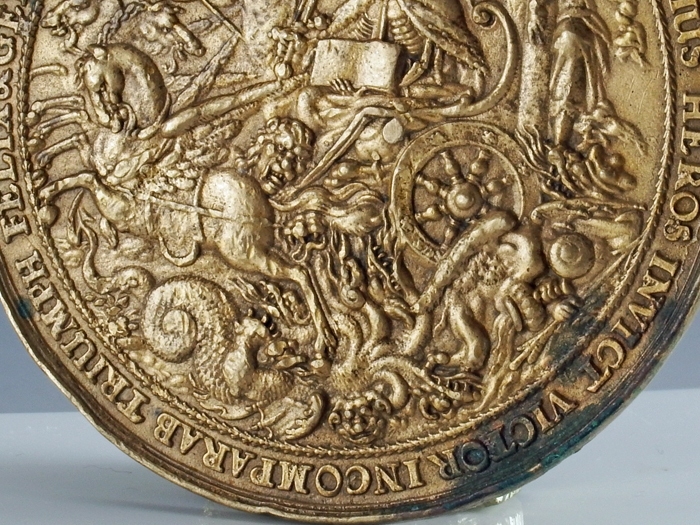 Two allegorical figures (Power and Faith), crowning the King's head with laurels. 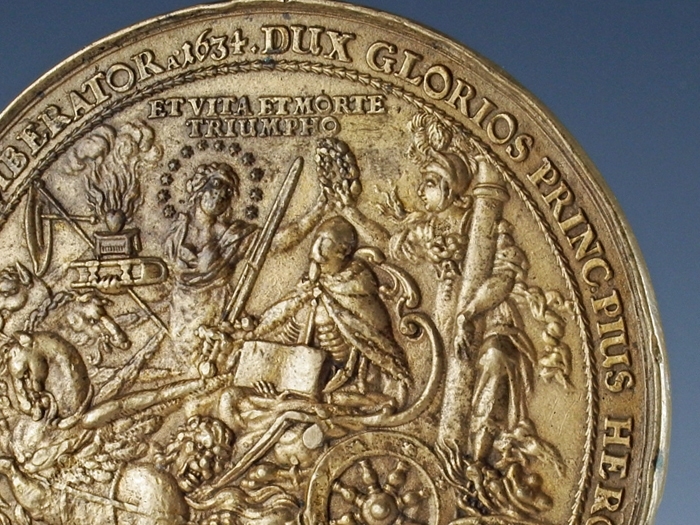 Above: ET VITA ET MORTE TRIUMPHO. 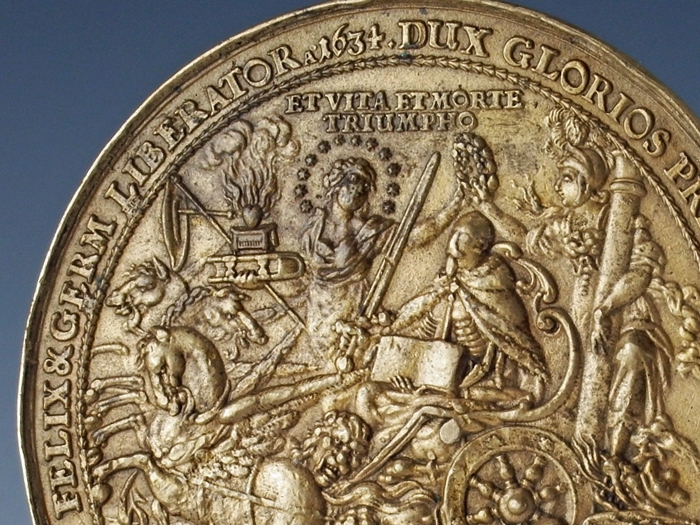 DUX GLORIOS PRINC PIUS HEROS INVICT VICTOR INCOMPARAB TRIUMPH FELIX & GERM LIBERATOR A 1634. 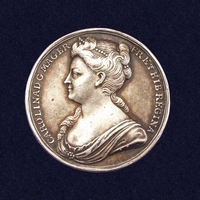 (Glorious Leader, Pious Prince, Invincible Hero, Incomparable Victor, Happily Triumphant and Liberator of Germany in the Year 1634).